Here is a very simple step by step tutorial on how to draw a nose from the front view. 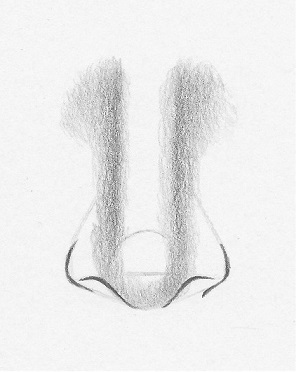 Below is a diagram of a nose broken down into 3 separate parts: the bridge, the nostrils and the ball or tip. Breaking things down into sections will make drawing noses a breeze! We will first use simple shapes/forms as guidelines to construct the shape of the nose and to maintain symmetry. – Mechanical Pencil with 0.5 mm HB lead by Ain (If you’re a beginner, it may be hard to shade with a mechanical pencil. You can use a blunt HB pencil for a smoother shading and blending experience). Draw a circle for the ball of the nose and 2 curved lines on each side for the bridge. Keep the strokes light so they can be erased in later steps. Draw a horizontal line through the middle of the circle and a diamond-like shape around it for the nostrils. Shade around the outer part of the bridge and around the inner part of the circle, making a long “U” shape. You will notice the shading is thicker at the top of the bridge. That is because the bridge of the nose leads into the brow bones. Don’t worry if the guidelines you created earlier didn’t blend in with your shading. We will darken the drawing later. Follow the diamond shape to create the nostrils. Now it’s starting to come together! Shade the nostrils and remember to leave some areas untouched so you can do some highlighting later. If you’re having difficulties shading, click here! Shape and contour the bridge and ball of the nose. You can shade around the top of the circle to make the nose look pointer or shade the middle of the circle to give it a flatter look. Use the eraser to dab areas which appear too dark, any lines that show through or areas you want to highlight. Next, you want to use a blending stump (learn how to use a blending stump here) to gently blend out the skin and give it a softer look. Add some touch-ups and go over your highlighted areas once more with a kneaded eraser. You can try different diamond shapes as well as circles to create more unique nose shapes. Experiment with shading to achieve longer, flatter, or more defined noses and so on. Click here to check out my tutorial on how to draw a nose step by step from the side. If you want to know where to place the nose on a face with correct proportions, check out my tutorial on drawing faces! 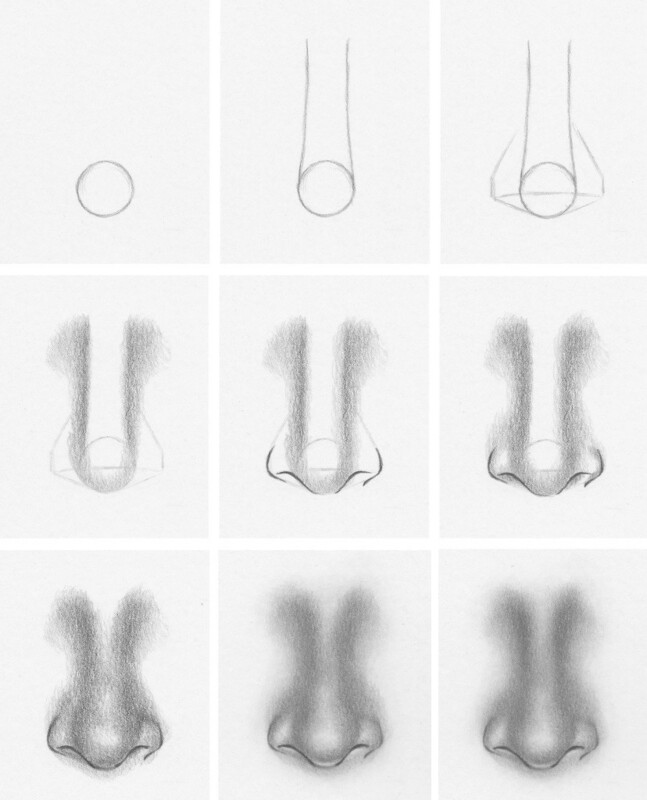 Enjoyed this simple nose drawing tutorial and know someone who will too? Share it with them using the share buttons below! Hi Darlyen! This is an amazing tutorial! I loved it! I love all of your videos! They help me so much! I was thinking that maybe you could give me some tips and pointers on how to draw eyelashes? This was posted on my birthday! Also thanks for the tutorial. Best teachings i ever got please add drawings of some wildlife if possiblE. Thank you for this very detailed tutorial. It’s really helpful! Sweet! Congrats on your A! Thanks! Your tutorials are best. You make everything in details and am able to understand. Please make a PDF book just like Lee ha!mind’s big book of drawing. Thanks Prosper! I’m planning to put together a book in 2018 :) Before that, there are still a few topics that need to be covered such as the human body and feet. I am just a begineer how to draw human face effictively and I really thanks for your guide. You are just amazing.How can I learn more by watching video?Pls guide me, Thanks. Thanks Nann! Unfortunatley I have not made a video for this tutorial yet. I’m planning to make it by the end of this year or beginning of next year. Hi Alissa, in the tutorial, I drew the lines darker than I usually would because they didn’t show up well when scanned. When drawing outlines, I draw them light enough that I can still see them. Hi Darlene, I was so surprised by your quick response… thanks so much! I appreciate it! Darlene, I am a musician working on some album art for what will be a free music album. I would love to use the nose you have drawn in the artwork. I want to ask your permission to use the picture of the nose. Full credit will be given to you for the drawing. Please let me know. Thank you! Would love to hear your music! this taught me something i thought i would nevvvvvvvvvvvvvvver be good at. ur work is pretty good. have a good life, lady. Its the easiest and best tutorial I’ve used, I’m amazed! I got a really good drawing first time! That’s awesome Marie! Your comment made my day :) Thank you! Hi Anthony, perhaps you’d be interested in my shading tutorial. It’s a guide that takes you through the basics of shading and covers various techniques and even ways to hold a pencil for a smooth, polished outcome. thanks darlene! ill be sure to try it! This helps a lot. Thank you. amazing! i try to draw noses and they always end up looking anime!!! Great tutorial, actually the best I´ve seen about drawing the nose en face! Thanks!!!! This really helped me with my art homework. Thank you!!! Thank you very much.Never knew drawing could be so interesting and easy..please can you do a tutorial on how to draw a croquis(model for dresses)…I would be very glad if you can..
Would it be okay to send you an email of some drawings of eyes/nose’s to get some criticism/feedback on how to improve them? I’ve just recently gotten into doing life drawings again and am looking to improve in any way I can and I can clearly see here that you’re pretty dang good! Looking forward to receiving your email! Plese check your mail THX! Easy to follow and easy to understand but what I drew looks like chicken scratch compared to your drawing. Can you make a how to draw hair post? I really like your tutorials they are easy to follow and the drawings are terrific! Thank you in advanced!! Thanks Nicole! I am going to make new tutorials soon. Thanks for the suggestion! I found your blog on Pinterest! Thank you for the fantastic tutorials! Thanks for stopping by Carli!! I struggle with drawing noses no matter what view they are in. I think by breaking it down the way you did I might be able to get better at it. I usually do it as one and it comes out looking like a boxer’s nose!